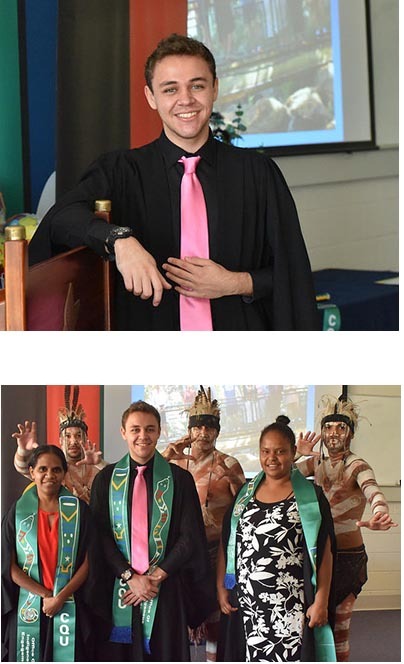 TOP: Dylan Dwyer at his recent TEP graduation ceremony at CQUniversity. BELOW: Celebrating with other TEP graduates, Rhasheda Solomon (left) and Dalihias Ware, and Indigenous dancers who performed at the ceremony. Western Queenslander Dylan Dwyer moved hundreds of kilometres east so he could springboard into tertiary studies hundreds of kilometres south. And now he has pledged to head back across the outback one day to support local businesses and Aboriginal people in his home town of Barcaldine. Dylan is a proud member of the Bidjara and Kurra Kurra peoples and his mother works for a local Indigenous corporation. Barcaldine might be known for the Tree of Knowledge but Dylan actually headed to CQUniversity when he needed an enabling program designed to help Indigenous people to transition into tertiary studies. “CQUniversity’s Tertiary Entry Program, known as TEP, was ideal as we had enthusiastic, personal support to gain the skills, knowledge and confidence to enrol in a degree program,” he says. “The comfortable environment of TEP is particularly settling for students moving from a rural setting to a city campus. CQUniversity’s TEP program involves units that embrace an Aboriginal and Torres Strait Islander focus to prepare Indigenous people for successful participation in university study. It offers learning experiences that are culturally and personally affirming. TEP is free of tuition fees and is a Centrelink-approved course. It’s delivered online, along with a compulsory residential school. Other recent TEP graduates have included Javina Warkill (progressing into a Bachelor of Laws); Rhasheda Solomon (Bachelor of Accounting); Edward Wason (Associate Degree of Engineering); Dalihias Ware (Bachelor of Social Work - Hons); Tiarne Hilton (Bachelor of Paramedic Science); Matthew Wallis (Bachelor of Health Science - Allied Health): and Christopher Dunrobin (Bachelor of Education - Secondary).